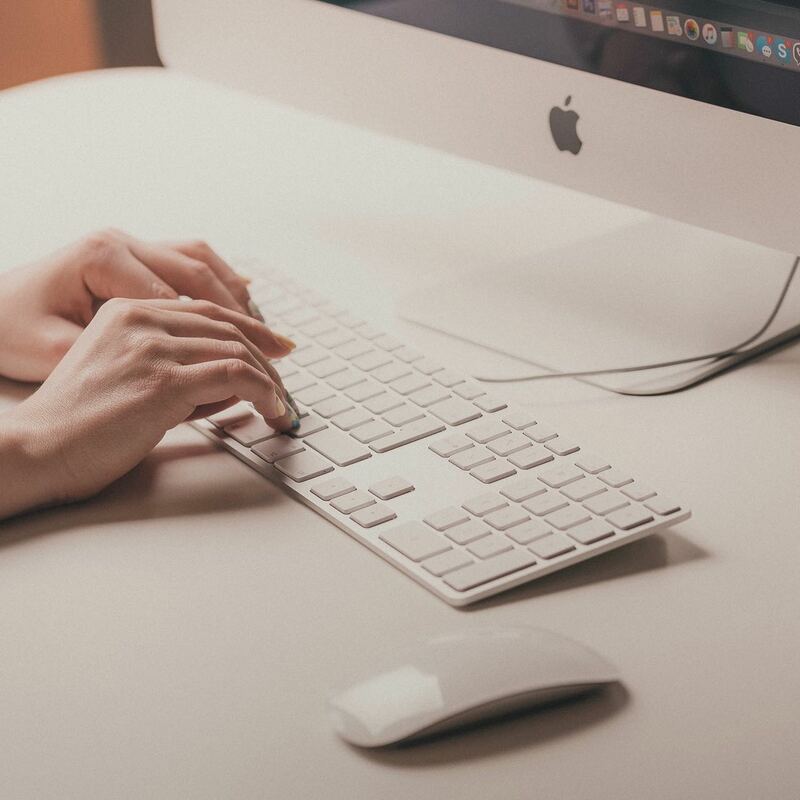 Blogs are for pastors that feel they don’t get enough uninterrupted attention in their normal work week. Okay, not really. 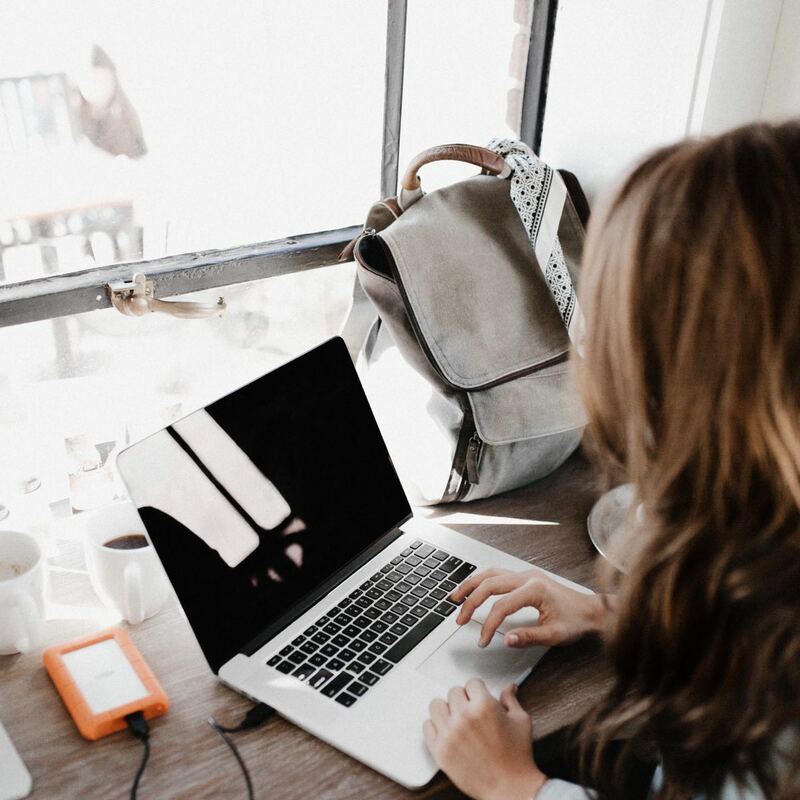 Blogs are a great way to educate, inspire, and connect your community outside of your normal gatherings. It’s for those that enjoy spending their time perfecting the written art form. 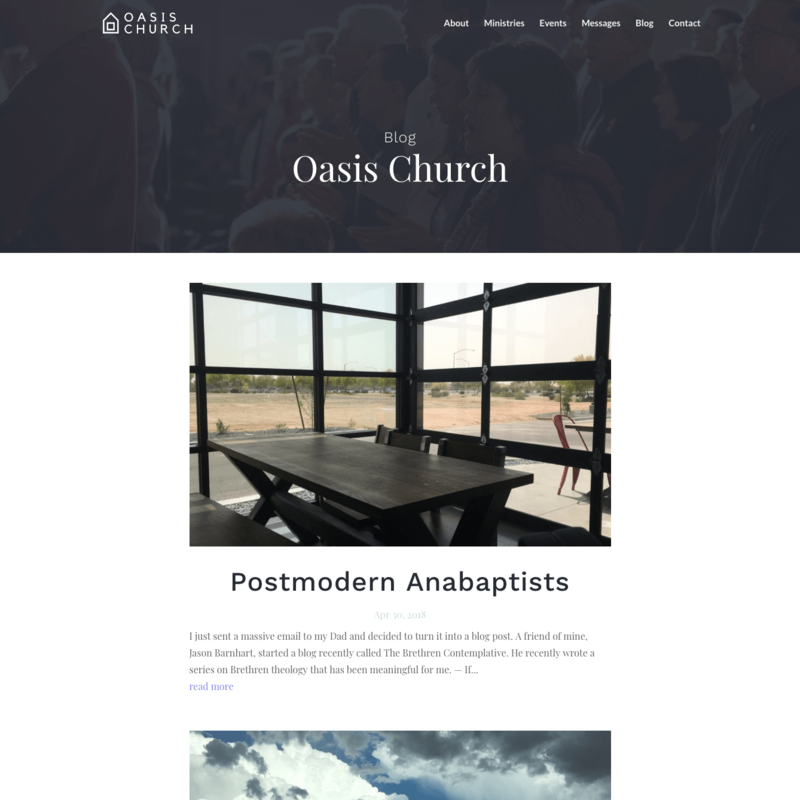 Every Postmodern Pulpit design comes with the option of a blog. They’re easy to use, clean design, and, if you’re like us, fun to keep up. Church calendars are vital to the life of a community. They’re how everyone knows what’s going on. At Postmodern Pulpit, we like to keep things simple. 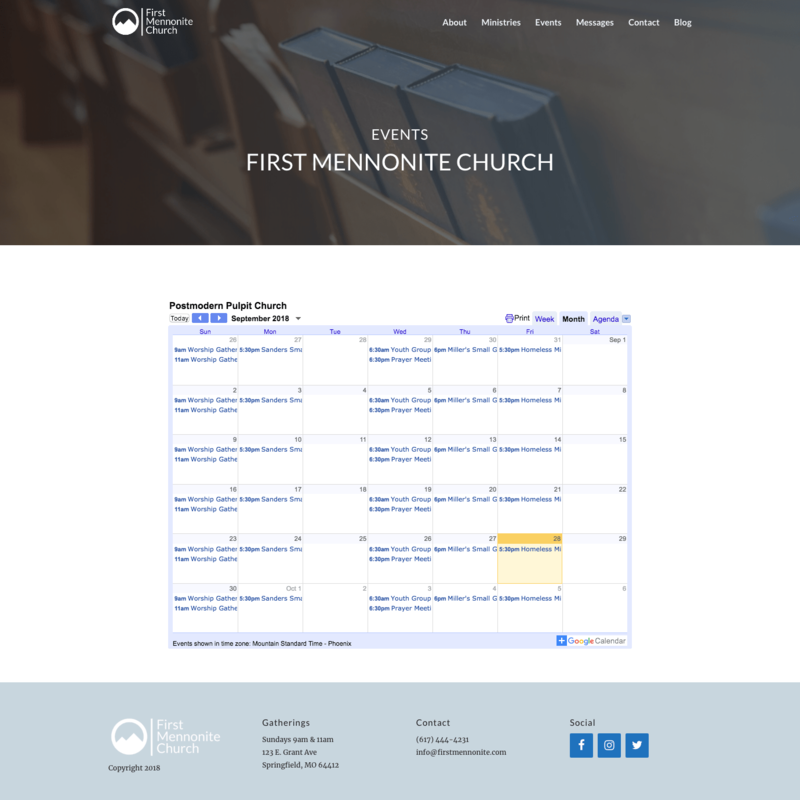 We have every design set up to include a Google Calendar on the site itself. That means you get to manage your calendar through your Google account, and it automatically gets updated on the site – pretty niffty, right? 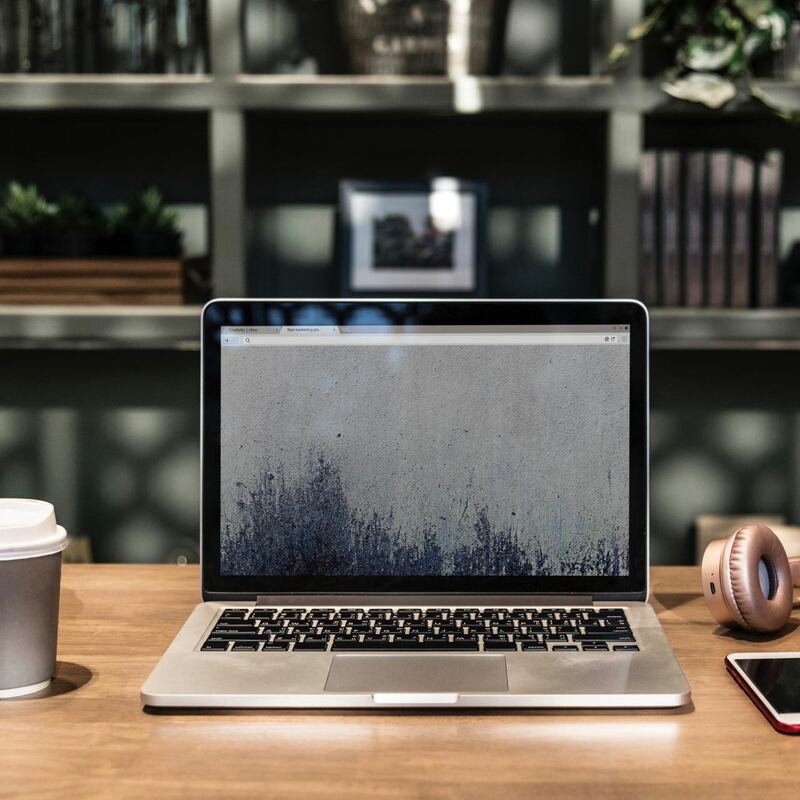 Publishing audio or video recordings of your weekly sermons is a great way to keep your entire community in the loop – even if they couldn’t be there in person on any given weekend. All our designs come with the option to upload and publish your weekly messages on the website. It’s as easy as picking the file, giving it a title, and pushing play. Email is one of the best ways to stay in touch with your community. Every Postmodern Pulpit website can include an email signup form where people can simply enter their name and email, and be signed up to your email list. From there, the email automatically gets added to your email marketing service, like Mailchimp, AWeber, Zoho, and more. Don’t have an email marketing service? We can help! They’re easy to set up, and might even be free, depending on how many people are on your list. Just ask us. Search engine optimization simply means helping Google know who you are and what you do. That way, when people search for something like you, Google knows to show them your website. 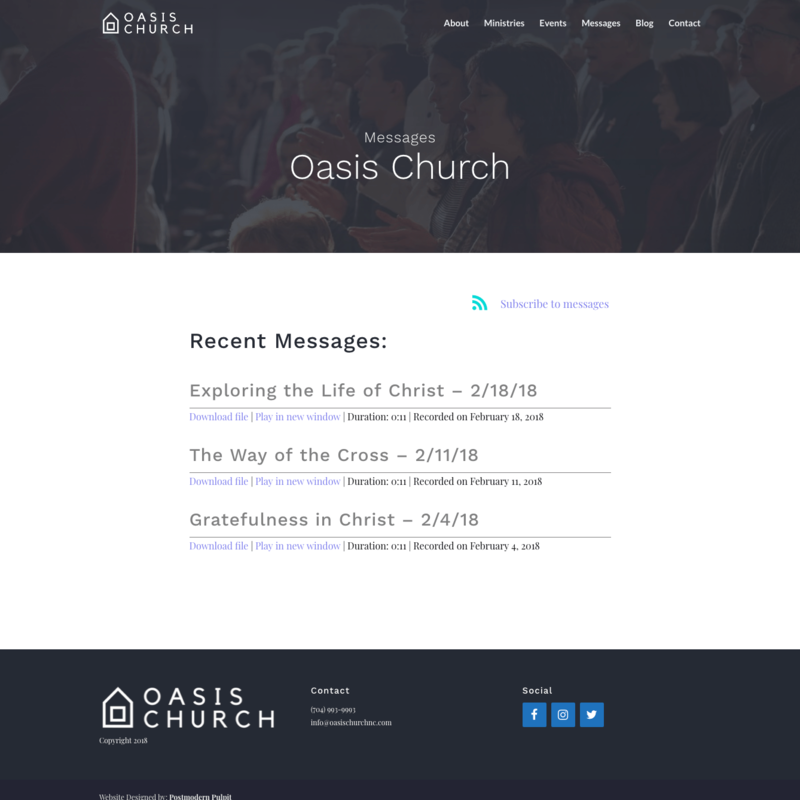 Every Postmodern Pulpit church website comes with a basic SEO setup completed. This is something we manually do for every new website before we push play. In the end, it will help communicate who you are and what you do to those in your community looking for something like your church. Every little bit helps, right? Online giving has become the norm in many communities. It’s convenient, easy, and the online giving companies seem to think it increases giving (who knows if/how much it really does). If you have online giving setup already, we’ll incorporate it into your website. If you don’t have something set up, we can help you pair up with an online giving company and incorporate that into our site. Note: this is not a feature Postmodern Pulpit owns and manages. We will simply incorporate a 3rd party online giving system into your website. Any fees associated with that service are separate from Postmodern Pulpit’s fees. 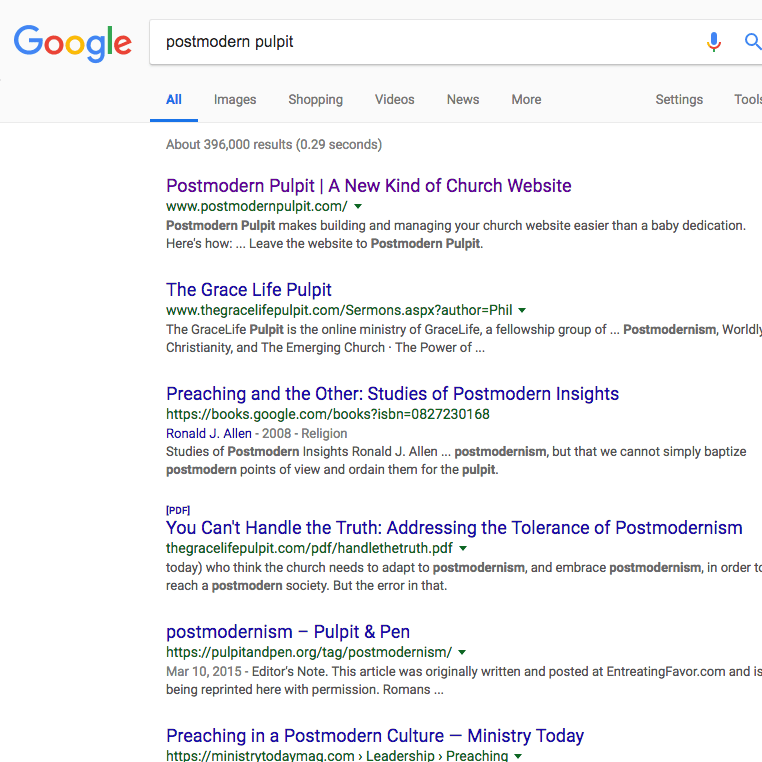 With Postmodern Pulpit, you’ll never have to re-learn how to log into your website and make changes again. New service time? New youth pastor? Just shoot off an email, and we’ll get in there and update it, pronto. How many times can you do this? Unlimited. That’s right, read it again: unlimited. Not as good as unlimited chicken nuggets, but, hey, that’s still a pretty cool feature. Our team is incredibly responsive, and really kind, so please, never hesitate to reach out and get your site up to date. Graphic design is a fickle thing. Before long, it starts to feel outdated. Luckily, we love design and are always releasing new templates and designs for churches to choose from. Included in your monthly fee is the right to update your entire website to one of our newer designs. No extra fee. That means in a year or two, when your site is starting to lose its hip-ness, all you have to do is check out our latest designs, pick your favorite, and we’ll move everything over for you. You probably won’t care as much about this, but it’s good for you to know all the same. Your website is run on software (a large part of which is called WordPress), and new versions are released every so often. If this software gets too out-dated, things start to break (that’s the nice way of saying it at least). 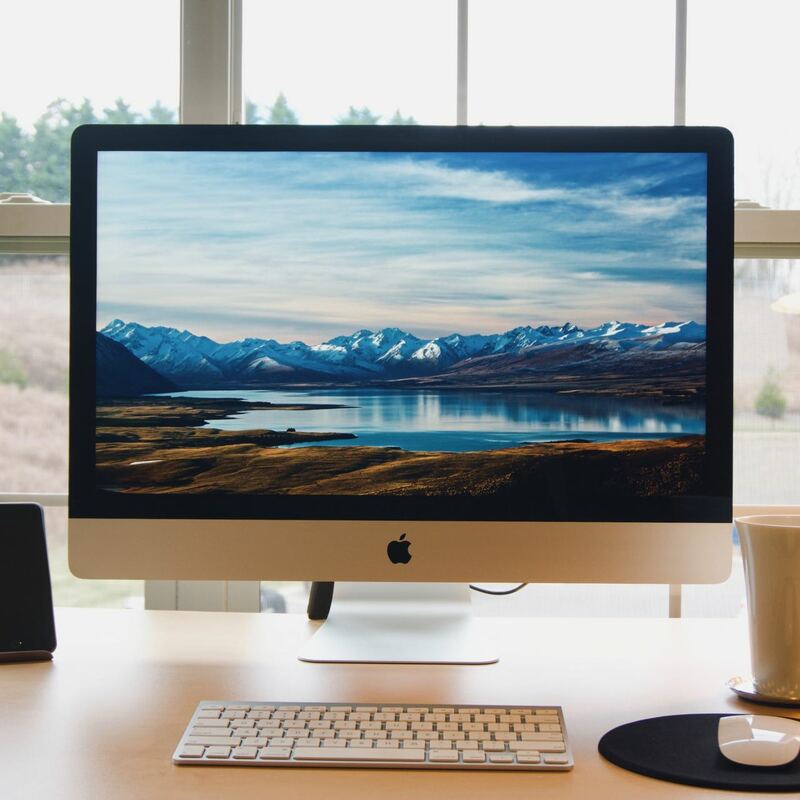 As a part of our services we go in and make sure your site has all the latest software so your website is running smooth from here until Kingdom come. Additionally, we’ll run regular backups on your website. The internet is crazy place, and sometimes things break or get deleted for reasons that are out of anyone’s control. The only way to protect against that is to simply make backups… regularly… which is what we do. All that to say, we’ve got your back. You don’t have to be a technical wizard. We’ll do all that for you. It only takes a minute, and will save you many minutes, many headaches, and many dollars.